Those of us who have dabbled in the world of horse racing are bound to have heard of Peter Scudamore. Such is the man’s stature, NetEnt has created a video slot game around him in Scudamore’s Super Stakes Slot at Wicked Jackpots. It is a 5-reel, 3-row, 32 paylines (20 fixed) video slot that will bring the thrill of the racecourse to online gaming. In the background, you will find an aerial view of the racecourse. You then will discover the reels, which contain a few horses, jockeys and gold cups. 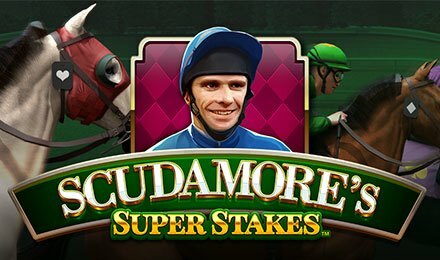 Scudamore’s Super Stakes is played using 32 (20 fixed) paylines. You begin by setting the Level selector, then adjust coin value to the desired stake. The number of bets also needs to be adjusted before play can begin. To do this, simply use the – and + buttons to confirm your settings. Press the Spin button at the bottom of the screen to start the game. There is also an Autoplay feature on the game which allows the player to set the number of rounds. Bet Levels: Scudamore’s Super Stakes has 1 – 10 bet levels. Amount of Paylines Selection: You will find 32 paylines (20 lines Fixed) in the game. Coin Values: The minimum value is 0.10p and the maximum value is £100. This feature allows two or five horseshoe symbols to land on the reels anywhere, turning the symbols they land on into wilds. When this feature comes into play, the reels are extended, and extra bet lines are added. If the winning horse is chosen, the player can win up to 5000x with this feature. Whilst playing Scudamore’s Super Stakes, the Bet Slip feature keeps tabs on how often a selected symbol pops up over a selected number of spins. It then pays the multiplier times the bet value. If three Golden Cup Scatter symbols turn up in reels 1, 3 and 5 within the main game, this will then activate Peter’s Classic Cup. Peter Scudamore Wild substitutes all the symbols on the reels, except for scatter symbols in the main game - this excludes Bet Slip symbols.